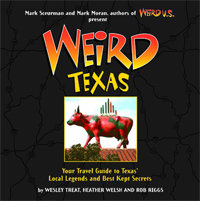 Growing up in San Antonio, I have heard and seen some pretty weird stuff. There are the haunted railroad tracks near Espada Park, Donkey Lady Road, Midget Mansion, ghosts of the Alamo, haunting of the Gunther Hotel, specters in Milam Square and many, many other oddities. It seems that San Antonio is the grand avenue of strange occurrences. A few not so known incidences are those of local businesses that do not want their strange events known. It would hurt their reputation. One of which is the formerly known Bexar County Hospital. My sister worked on the oncology ward as a medical clerk. She would come home and tell us stories of the lady in white making her way down the hall performing her own Dr. Kevorkian rituals. There was a rash of deaths taking place on the ward and it was going from room to room in order down the hall. Now while it seems that it would be common to have deaths on this type of ward, the fact that it was progressing in order according to room number was what was bringing it to the staff’s attention. 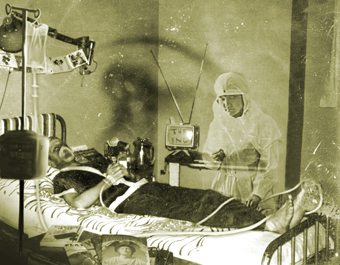 Several patients before meeting their demise would ask who the nurse in the old time uniform was that was coming in their room in the wee hours of the morning. Many patients had video and diagnostic monitors on them with displays at the central nurse’s station. Nurses could quickly review the status of patient’s stats so as not to disturb them during the night. But abnormal things started to happen. Patients would be seen talking or holding their hands out to someone not seen on the monitor. Privacy curtains would suddenly close around the bed obstructing the camera’s view. One nurse had to repeatedly replace a tracheotomy tube that kept popping out of a patient’s neck. They watched the monitor to see if the patient was doing this himself and were startled to see it come out, seemingly of its own accord. When they started watching the monitors more closely, the staff caught glimpses of a white figure moving around patients’ beds. The strange deaths stopped when one patient died and the next room that would be in the progression was vacant. A patient’s room across the hall was experiencing problems with the electrical wiring and it was suggested that they move her into the vacant room but staff members did everything they could to relocate her to another area. That is when management asked what was going on? The staff was told to keep quiet about their suspicions and that people would get fired if it leaked out. Several staff members, including my sister, soon turned in their resignations.